Madrasah Hashimiah, in Kuala Lumpur, Malaysia, is a school for refugee children that Tzu Chi helps fund. Most students at the school are Rohingya from Myanmar. For more than ten years, Tzu Chi volunteers in Malaysia have been helping Rohingya refugees that have escaped persecution in Myanmar and settled in Malaysia. I work for the Kuala Lumpur and Selangor branch office of Tzu Chi Malaysia, where I have dealt with refugee matters for 12 years. Refugees in Malaysia face many difficulties. Their children cannot attend regular schools, and, without permits to work legally, they are often exploited. They have no choice but to do “3D jobs”: difficult, dangerous, and dirty, the three dimensions of refugees’ work. One might also add a fourth dimension: diminutive—in salary. As a result, refugees are generally malnourished, and when they fall ill, they often suffer through it without seeking medical care because they can’t afford it. They also avoid seeing a doctor because they are afraid of getting caught by the police. They really need all the help they can get. Early one morning, people formed a line in front of a building on Pudu Road, in Kuala Lumpur, Malaysia. They were waiting for the Buddhist Tzu Chi Free Clinic to open for the day. Though there were refugees from the Middle East, Central Asia, South Asia, and Africa, most were from Myanmar. 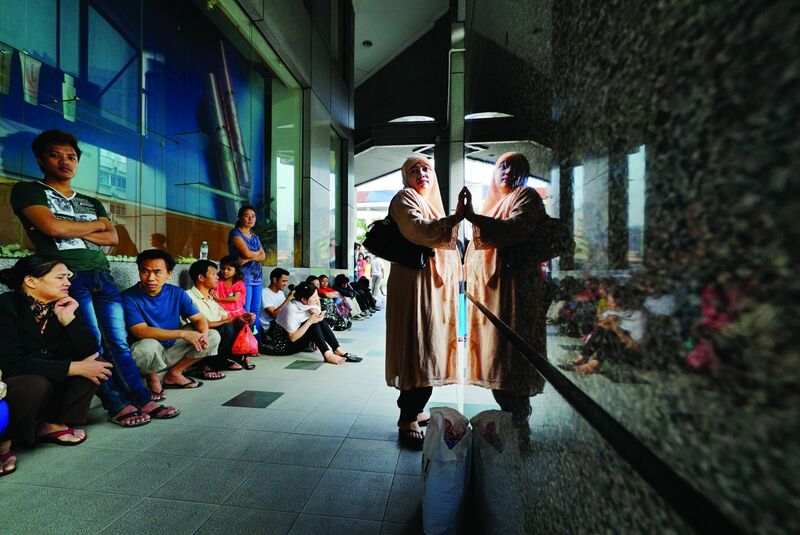 Mohd Hanif Bin Mohamed, a 21-year-old staffer at the clinic, began to distribute numbers to people in the waiting line. The crowd pushed forward and there was quite a stir. The stocky Hanif, however, handled the situation with ease and a smile. He is fluent in English, Malay, Burmese, and Rohingya, and so he had no problems communicating with the waiting patients. The clinic is open six days a week, closed only on Saturdays. On average, 150 patients a day are treated there. Six refugees from Myanmar, Afghanistan, and Pakistan work there translating, checking in patients, assisting physicians, and doing whatever administrative work is necessary to keep the clinic running smoothly. The clinic offers a variety of services, including family medicine, dentistry, physical therapy, psychotherapy, AIDS screening and prevention, and traditional Chinese medicine. Hanif came with his parents to Malaysia from Myanmar when he was eight years old. They were Rohingya refugees. His father supported the family of eight by scavenging garbage to sell. Hanif studied in a UNHCR Tzu Chi Education Centre where he completed his elementary education at the age of 16. After that he worked picking through garbage to help support his large family, which continued to struggle to subsist. Hanif’s life started to change for the better at the age of 19, when he started working for the Tzu Chi Free Clinic as a translator. His regular income has since enabled him to adequately feed his family. He is not resentful when he looks back on the tough times before. He is instead grateful that he has gotten involved with Tzu Chi. A stable job that pays regularly has helped make the lives of his family easier. Now they live not in despair but in hope. When asked about his native land, Hanif says he has only vague memories of Myanmar. Though he never actually witnessed any military battles when he was there, he feels hurt when thinking of his home country, like an overhanging shadow over his heart. The feeling is probably the result of having listened to discussions of horror stories among his family and friends over a long period of time as he was growing up. To Hanif, Myanmar seems far removed—in time, in space, and in emotional connections—and he has no intention of returning. His greatest wish is that he and his fellow Rohingya will one day be accepted in Malaysia so that they may have access to education, medical care, and employment. Many other Rohingya refugees in the country share that wish. Live in a place long enough, and it grows on you and becomes home. The birthplace or homeland fades with time further and further into the retreating past. Mohd Rafiq, about 40, is another Rohingya who has sought refuge in Malaysia, where he has lived for more than a decade. In Malaysia, he once worked for the United Nations as an interpreter. He got paid only when he worked. It was better than nothing, but his pay was unpredictable, which was hard on his family. Eventually, he got hired as an English and mathematics teacher at a UNHCR Tzu Chi Education Centre. A steady income has replaced the unpredictable, fluctuating pay, so he has been able to better provide for his family. He, his wife, and their son now have a place to live, courtesy of the education center. Unprompted, Mohd Rafiq told me a story about an illegal foray into Singapore. Though now settled in Malaysia, he told me that he had initially come here only as a staging area for his final push to sneak into Singapore, his real destination. He worked in Johor Bahru, the capital of the state of Johor, Malaysia, waiting for his chance to slip into Singapore. He worked and waited in Johor Bahru for several years. One day, the wait was finally over. He and others were arranged to hide in a factory in an industrial park, where they stayed for a few days. Then very late one night, they were loaded into a vehicle and driven through pitch-dark jungles and swamps. When they finally arrived, they were transferred to a sampan. On board were already a dozen people from Vietnam, Sri Lanka, and China. The boatman ordered them to go to the lowest level of the skiff and hide. It was such a tight space they had to embrace the next person for all to fit in. It was undoubtedly too close for comfort—there was no escaping body odors, no escaping heavy breaths. Though uncomfortable and constrained, they uttered not a sound. The vessel pushed on for nobody knew how long, sometimes fast, sometimes slower, as the hull cut through the waves. They eventually arrived at a shore and could finally leave the cramped space. Once on dry land, everyone followed a man and ran frantically into a building that looked like a factory. They spent several days in hiding before being loaded onto a truck, driven some distance away, and dumped on a street somewhere. They were on their own now in Singapore. Mohd Rafiq tried to blend in with Singaporean crowds, and he watched out for signs of danger for illegals. He asked for work at many places, but no one wanted to hire him. Though he saw many foreign laborers from South Asia around, the streets in Singapore didn’t feel as free to him as those in Malaysia. Two weeks after he landed in Singapore—two weeks of fear, anxiety, hunger, and sleeping on the streets—he turned himself in to the police. He was held in custody for a month, then given 50 Singapore dollars (US$36), put on a boat along with others who had been in custody in the same place as he, and repatriated to a seaport in southern Myanmar. Not long after that, he was back in Malaysia. Loose border control and rampant human smuggling groups made it easy to cross into Malaysia. Besides, Malaysia is a Muslim-majority nation, and much more likely to accept Muslim refugees like Mohd Rafiq and his people. That is why many Rohingya end up there. To serve refugees, including the Rohingya, Tzu Chi started offering monthly free clinics on Imbi Road, Kuala Lumpur, in 2006. Many refugees worked and lived in that area. The services there only came to an end in 2010 when volunteers obtained permission for the Tzu Chi Free Clinic located on Pudu Road, which had been established to provide medical services to the needy in Malaysia, to provide care for refugees as well. Tzu Chi also once provided on-site medical care at refugee detention facilities and provided a referral service for cases that needed special medical care. With all these efforts, volunteers have hoped to help ease refugees’ lives in a foreign land. 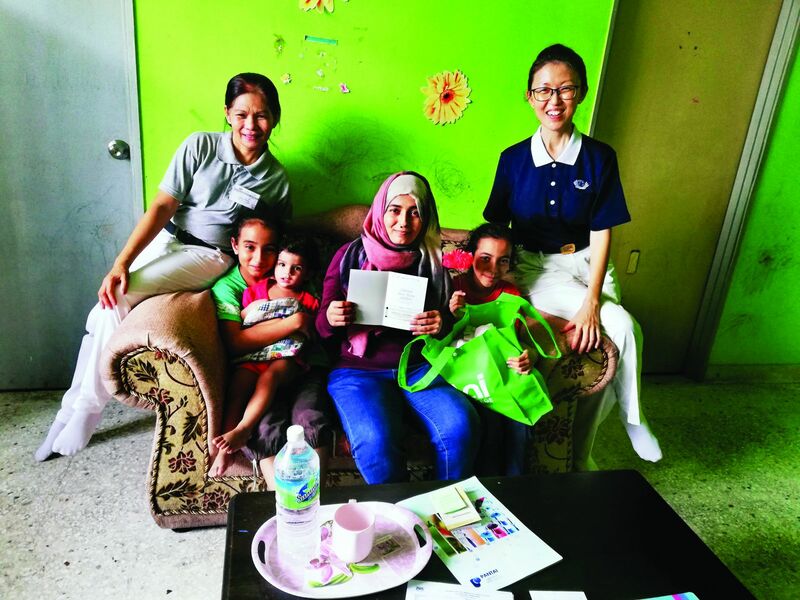 Tzu Chi volunteers once paid monthly visits to this detention facility in Bukit Jalil, a suburb of Kuala Lumpur, to provide medical care to refugees who were locked up there. Many Rohingya refugees rent units in this apartment building in Ampang, Kuala Lumpur. Their rents are collected by people who don’t even own this property—it has long been deserted. Dr. Foo Seay Liang (符之良) went to Chung Shan Medical University in Taiwan for a medical education more than 20 years ago. Afterwards he returned to his native Malaysia and practiced medicine as a general practitioner. In early 2013, he started volunteering regularly at the Tzu Chi Free Clinic and got to work with refugees firsthand. He saw many suffering from chronic diseases. He felt that more comprehensive care should be planned and offered to those patients, so he quit his well-paid job and became the director and a physician at the Tzu Chi clinic in 2015. To ensure that patients suffering chronic diseases get timely and proper care at the clinic, Foo has promoted a system for patients to make follow-up appointments to see clinic physicians in the future. These follow-up appointments help physicians track and manage their patients more easily. Because it is partly funded by the UNHCR, the clinic needs to comply with the rules that have come with the money. The UNHCR requires that the clinic provide services in psychological counseling as well as the usual clinical services. Under the unrelenting stress of life every day, be it the struggle to put food on the table or the fear of running afoul of immigration officials, many refugees have become psychologically unwell more than physically unwell. Therefore, psychological counseling has been an important part of the collaboration between the Tzu Chi Free Clinic and the UNHCR. Ong pointed out that Rohingya refugees talk to her about gang rapes and sexual assaults more than anything else, while Taliban females are often confronted with problems related to underage marriage. Their homes were destroyed in military conflicts; they fled their countries; they endured hardships and fears during their escape; as refugees, they face risks of being exploited, abused, or sexually assaulted. Ong knows the challenges refugees face, so she also has established an appointment mechanism for patients to schedule intensive and regular psychotherapy sessions for their emotional or mental issues. The UNHCR and Tzu Chi jointly host an annual athletic event for Madrasah Hashimiah, Unity School, and Harmony School—schools for refugees. The UNHCR signed a memorandum of understanding in 2007 with Tzu Chi, making the latter an implementing partner in the Community-Based Literacy and Numeracy Program. As such, Tzu Chi volunteers were to visit Rohingya refugees and other peoples of the Islamic faith from Myanmar in some areas of Kuala Lumpur and formulate a plan to provide education in basic reading, speaking, listening, writing, and arithmetic for refugee children. The plan was also to get a good understanding of the situation and needs of refugees. In the process, Tzu Chi volunteers found that of the Myanmar refugees in Malaysia, the Chin and Kachin peoples had received more assistance than the Rohingya people. Rohingya and other peoples of the Islamic faith from Myanmar may worship and celebrate Islamic festivals with local Malay people in the same mosques, and assimilate more easily into the local communities because of their shared religion, but Malay aid organizations rarely extended help to the Muslim refugees. This was a group that could use some help from the Tzu Chi and UNHCR collaboration project. Four Rohingya communities were selected in which to establish UNHCR Tzu Chi Education Centres. The initial intention was for Tzu Chi to help the Rohingya independently run these schools themselves, but that turned out to be a goal too difficult for the Rohingya to achieve. The operation of two of these schools was later transferred to local Islamic organizations, and the remaining two schools—Harmony School in Selayang and Unity School in Ampang—have been run entirely by Tzu Chi. Volunteer Arinna Tee Bee Leng (left) teaches a weekly class in Chinese language at Madrasah Hashimiah. The school hopes to provide refugee children with a better future by offering classes in the Quran, languages, and arithmetic. Outside of that arrangement entirely and without any UNHCR funding, Tzu Chi started funding Madrasah Hashimiah in 2004. (A madrasah is a school, particularly for Islamic religious instruction.) Being a religious school, it does not qualify for UNHCR funding, and Tzu Chi does not get involved with its operations except for providing the funding. Ustaz Hashim Bin Kassim, the principal of the school, was once a laborer. He fled from Myanmar to Thailand in 1995 before eventually settling in Malaysia. He started out by working in the Selayang Wet Market. He saw many children of his own nationality and religious faith wandering in the streets, so he set out to teach them a code of conduct under Islam. His endeavors turned into an Islamic school for refugee children. In 2004, Tzu Chi volunteers heard about the financial difficulties the school was facing when they were providing free medical services in the community. That’s how Tzu Chi started providing financial aid to the school. The students at Harmony School and Unity School consist mostly of Rohingya and a few Pakistanis. The former school currently enrolls 190 students, with 100 at the latter. Character education is included in these two schools too. In general, the parents of the students don’t really appreciate the significance of education. Coupled with that problem is the uncertainty in refugees’ lives—unstable jobs, a greater tendency to move due to changes of jobs or other factors. All of these factors manifest themselves in school in the form of high absenteeism, unsettled students, and a lack of parental involvement in their children’s school life. Issues like these only add to the challenges that teachers at these schools must deal with, on top of teaching. A Rohingya refugee works at the Selayang Wet Market. The red advertisement signs at this popular gathering place for refugees and foreign laborers, located near Petaling Street, a Chinatown in Kuala Lumpur, show that Kuala Lumpur is a multiracial, cosmopolitan city. Sahidah just summed up the struggles that she and her fellow refugees have had to face, and she should know. She has been a refugee in Malaysia for more than 30 years. She wasn’t able to have her diabetes treated because she couldn’t afford the service. As a result, she had resigned herself to living with the disease and suffering the resulting pains that had sometimes disrupted her sleep. That only changed when Tzu Chi started offering free clinics. She is grateful that Tzu Chi, a Buddhist organization, is willing to provide free medical examinations and medications for Rohingya refugees, who are Muslims. More Rohingya have settled in minor Malaysian cities in recent years. In response, the UNHCR enlisted the help of Tzu Chi volunteers in 2016 to carry out a cash-based intervention (CBI) project to help more refugees. The project aims to provide financial assistance to refugees who have temporarily lost their income or are experiencing significant crises. As part of the project, Tzu Chi volunteers visit the homes of refugees on lists provided by the UNHCR, fill out assessment forms, and input data into the CBI system, which calculates the amount to be given to each case. Each case is valid for three months, and renewals are made only if warranted by reassessments. If a family has a special need for medical care, education, legal consultation, or psychological care, the case will be handled separately. On this day, volunteers went to Cheras, Kuala Lumpur, to visit a beneficiary of the CBI project. They walked up four flights of stairs in an old apartment building without an elevator. On the fourth floor lived Arsyad. He was feeble and unable to stand because his kidneys and liver had stopped functioning normally. His sister lived with him to care for his needs. She used to work and live with her husband in Ipoh, the capital city of the Malaysian state of Perak, but she moved in with Arsyad when the latter began having serious health issues two years before. She left her husband behind when she moved, but fortunately he was very understanding. After all, Arsyad was her brother and had no one else to care for him. Arsyad told the volunteers that he had fled Rakhine State, Myanmar, more than two years before, at the height of the Rohingya persecution in his homeland. His village had not been burned down, but many Rohingya had been expelled from their homes. Arsyad was working out of town at that time, and he found himself unable to go home. That’s when he decided to flee the country with friends. After he reached Kuala Lumpur, he contacted his parents, who had stayed in the village, to tell them that he was all right. He found to his relief that his parents were safe and sound. However, his village was under the control of the military, and villagers couldn’t leave the village without authorization. Refugees get dental care at the Tzu Chi Free Clinic in Kuala Lumpur. Dr. Foo Seay Liang is the director of the Tzu Chi Free Clinic. After earning his medical degree in Taiwan, he returned to Malaysia where he later quit a well-paid job to take his current position. About 160,000 people, of whom more than 30,000 are Chins, have registered as refugees or sought asylum in Malaysia. Chin refugees first settled there almost 20 years ago. Only Rohingya refugees have a greater presence in the country. Not long ago I visited Mung Khat, the chairman of the Alliance of Chin Refugees, in Kuala Lumpur. He showed me a letter from the UNHCR Malaysia office which announced that the agency had decided to end the refugee status of the Chins after the last day of 2019. This news caused much consternation among Chin human rights groups. Chin refugees are apprehensive of their return to Myanmar, where they don’t know whether they will be safe or whether they will be allowed to return to their original area of residence. They fear that they will be persecuted and exploited all over again and end up in exile in Myanmar. Refugee rights groups, including the APRRN, have urged the UNHCR to postpone the implementation of that policy. There is no quick fix for the refugee problem, not only in Malaysia, but in many other places around the world. Amidst the clouds hanging over refugees, Tzu Chi volunteers try to bring a ray of light by providing medical care, education, and other assistance. Their efforts, though small in the grand scheme of things, have sparked a glimmer of hope in some refugees’ otherwise grim and long-drawn-out struggles. Tzu Chi volunteers help the UNHCR carry out a cash-based intervention project whereby financial aid is given to refugees who have temporarily lost their income or are experiencing significant crises.